Officers Brett Ortiz, James Mcguire and Argenis Rosado meet with community members at the 40th Precinct’s Sector C Safety Meeting at the Metropolitan College of New York campus on 149th St.Photo: Chris Hickey. Several pizza boxes laid unopened on a table just inside the entrance of the Samuel Gompers Career and Technical Education High School Auditorium at 455 Southern Boulevard. Fewer than a dozen community members trickled in and sat in the first two rows inside a space that could easily seat hundreds. Jackson, the supervising Neighborhood Coordinating Officer, or NCO, for the 40th Precinct, was hoping for a better showing. 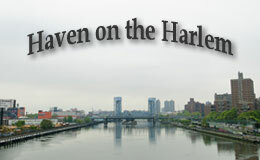 More than 90,000 live in an area from the banks of the Harlem and East Rivers to 161st St. to the north—an area that about 300 officers in the 4-0 patrol. 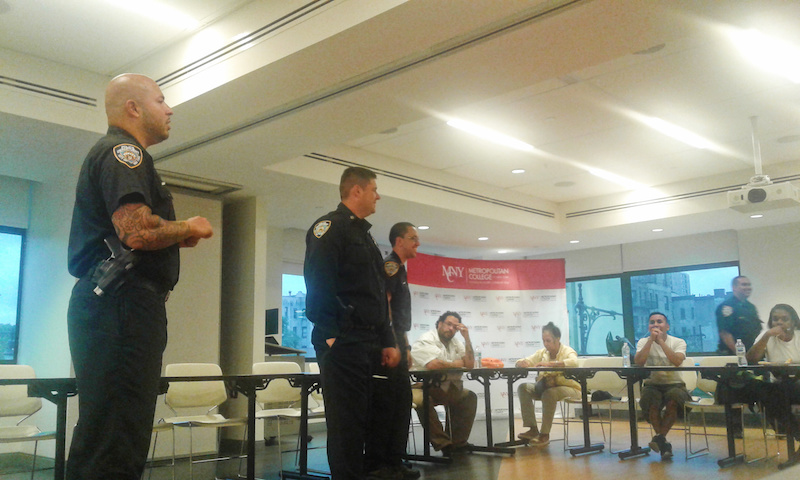 Jackson led the community safety meeting alongside another NCO, Michael Nesto, and three other patrol officers. The meeting was one of four that they helped organize in September. 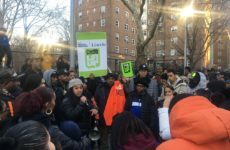 The Gompers High School event addressed issues in Sector A, encompassing an area on the precinct’s eastern and southern boundaries. The few who did attend complained about a preponderance of used syringes and needles being discarded in parks and playgrounds by people who frequent the Hub’s numerous methadone clinics. In a precinct that last year that saw a rise in murders, felony assaults, robberies and rapes, the officers are asked to tackle a range of problems beyond violent crime in their combined roles as community liaisons, patrol officers and investigators. They freely distribute business cards with cell phone numbers and email addresses so community members can call with non-emergency complaints. But some attendees of safety meetings, like St. Ann’s Episcopal Church sexton and life-long Mott Haven resident Brian Lyons thought officers from the 4-0 should be even more visible. In response, Sgt. Jackson said he’s encouraging the officers to walk the neighborhoods. Despite some hiccoughs early in the program’s rollout, the officers say they hope to gain momentum by connecting with residents and businesses. “People have their doctor, their mechanic. 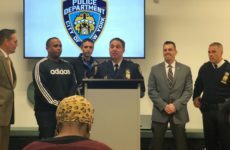 We’re your cops,” said Officer James McGuire, addressing community members at a meeting that covered Sector C, the area between 149th St. and 159th St., between Park and St. Ann’s avenues. There, a discussion on lighting led to attendees sharing information on who to contact at the parks department for a request to trim trees around light poles.